Fantasy basketball top value plays and sleepers on #FanDuel and #DraftKings for Friday, March 31. When it comes to daily fantasy sports (DFS), and basketball in particular, there's a lot of data out there that can help you make lineup decisions. One source of helpful data is FantasyLabs, an analytical sports resource site that features DFS projections as part of its stock of premium content. FantasyLabs provides a wealth of data available at the fingertips of the DFS player to help identify top plays, save time in building multiple lineups, and look at where the value is in a given slate of games based on factors ranging from projected ownership to simple projected points per dollar. Players can even tweak the model based on what they weight to be the most important factors, and the FantasyLabs model will spit out a rating for the individual user that ranks players based on his or her preferences. There's also up-to-the-minute news scrolling in a sidebar that makes it easy to follow breaking injury reports. We're going to provide a sampling for free right here on PokerNews Sports. Each day this recurring article runs, we'll go over three of FantasyLabs' top value plays on both DraftKings and FanDuel using the premium projections. We'll take a look at why these players could represent value and show you what FantasyLabs expects out of them statistically. All stats are projected totals at the time of writing. Ceiling and floor represent the top 15 percent and bottom 15 percent of a player's projected outcomes, respectively. It looks like Marc Gasol will be sitting once again, and JaMychal Green will also miss tonight's game. The ever-hobbled Grizzlies will be very short-handed up front, and many a DFS player will click on Zach Randolph. That's a fine play, but digging a little deeper, Wright may be even better on a per-dollar basis. He's priced a hair above the minimum but figures to see about 20 minutes. He is capable of racking up some blocks and should have a field day on the boards against Dallas, which ranks dead last in rebound rate. FanDuel has still not adjusted Smith to where he should be priced. He's sitting at just $5,300 when DraftKings has moved him to $6,100. And this price was locked in before he put up the 21-6-5 he posted against Brooklyn on Thursday. As long as Reggie Jackson is banished from the rotation, which appears to be the case for the moment, Smith is a premium play at this price. Keep an eye on the news wire to see if Jackson gets some more love, but even if he does, Smith is a good cash play as long as he starts. We tried Sweet Lou last time out against the Warriors, and he had a passable performance but didn't quite give us what we hoped for. Still everything that made that a great matchup makes this one plenty nice as well. It should again be a high-paced game that features plenty of transition chances for both teams. Furthermore, with Ryan Anderson sitting out, Eric Gordon pushes into the starting lineup, which means Williams gets off the bench even quicker than usual right now. He's a good GPP play. With the season starting to look like it was on shaky ground for the Warriors and the Spurs closing in on the top seed, Andre Iguodala has emerged to help right the ship with some outstanding play in recent weeks. Iggy is regularly seeing 30+ minutes and has put up at least 28 DK points in each of the past three games, including a 12-6-6 line against these same Rockets on the road. Despite that, Iguodala can be had for $400 less than in that contest, and his stat-stuffing ways bring big upside for GPPs. The Greek Freak has been this cheap exactly one time in the past few weeks, and perhaps somebody told him about it, because he exploded for the first of two straight 65+ DK point games. After a couple of mediocre outings, his price has dropped again, so he's priced to buy here in a matchup with Detroit. The Pistons will have to choose between sticking Kentavious Caldwell-Pope on Antetokounmpo or Khris Middleton, s someone's going to get a friendly matchup. 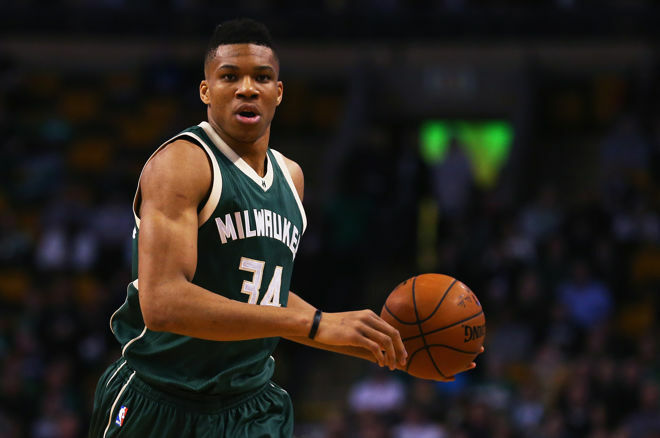 Roll the dice on Greek Freak at a bargain in GPPs, but he's a little risky in cash. The Pacers are sliding with four losses in the past five games and could be in danger of losing a playoff spot. George has responded by ratcheting up his usage, taking at least 17 shots in six straight games as he tried to make sure the season doesn't slip away. He'll be up for this key matchup with DeMar DeRozan and will definitely be a threat to go for 50+ DK points as he has in three of the past five games. George offers a nice floor as a cash game option as well. Want to see all of today's top plays on DraftKings and FanDuel? Try FantasyLabs' premium tools!